I have never been without a dog during my adult life. Teddy was our first Golden, the most patient and lovable of dogs…and there followed our other faithful and wonderful companions– Toby, and Brownie, and Jeannie, and Prinny, and then Bear..who together with Prinny eased the pain of Toby’s death… as well as the deaths of my irreplaceable parents. We cannot imagine life without our dear animals. They gave so much…and were there through both the happy and difficult times…as were Anne’s dogs dear Benny and Bullet and Brodie and Becca’s little Smokey. Each deserves his/her own story someday. And this summer when cancer took our Goldens Bear and Bulley, such a void occurred. Anne, whose middle name is “animal-lover”, was on the lookout…not for a replacement dog…there couldn’t be…but another dog who needed us. She sent me a computer link to a pet rescue organization called Double Dog Rescue. I scrolled through the photos, clicking on the additional information. Every dog had its story, every dog was in need of a good family. How could one choose? When I got to the end of the alphabetically arranged page, I saw a pointer named Violet. Her little face looked comical, half brown and half speckled white, and her eyes, oh those eyes, were deep and brown… and they spoke to me. The other pictures of her showed a slightly pudgy female, recently having had pups. The bio told how she missed her puppies so much after they’d been taken away…so another pup was put in the pen with her for companionship. She would, we were told, follow the person who cleaned the kennels, so eager to have a friend. Anyone who adopted Violet would be very lucky, the bio said. The third photo of her showed the girl laying down with her front legs crossed and again those expressive eyes speaking to me. And so, I sent in an application. I’d have to be approved by the rescue organization. Yes, we had a large fenced-in yard, were experienced with dogs, had cats, and would of course, love her and care for her… always. Time passed. Somehow the transport from Alabama had not taken her on schedule and we’d have to wait another week. Had I made the right decision in getting an dog unseen? I was told that we could of course meet her first…and refuse her. She could go to a foster home instead. The transport was to arrive in Glastonbury on a Saturday morning. We found the large parking lot, the assigned spot. Already people had begun to gather, dog people we knew. You can tell. The friendly person in charge greeted us and made us feel better. We must have had the shy, hesitant, and expectant look many of the adoptees would have. We recognized the potential foster parents also– a lovely couple who gave their home and time and affection to make the newly arriving dog safe and secure while waiting for a permanent home. We were told that the transport would be delayed a bit…another cup of coffee for us. And then the huge tractor trailer appeared and drove into the parking lot. We’d had our talk about what to expect from our dogs. Imagine what they were feeling about now, having started the journey in Alabama and then to Tennessee and upward to Connecticut. Saved from shelters and former lives that would hopefully be forgotten forever. About 120 dogs, heading north to new homes…a chance at life. The new owners lined up as the huge door rolled open. One by one we gave our dog’s name…and the kindly transport person would go into the cavernous trailer where kennels were three high…and the prospective dog would be led out and down the ramp to his/her new family. How happy a yellow lab was…you could almost see him laughing, and how timid the little pups who came next who went to twin girls. One by one… It was my turn and my voice choked unexpectedly when I spoke the name Violet. Almost a holding of breath…and then she appeared at the doorway…smaller than I had expected, but sweet and shy and trembling as she came off the ramp. Her lead was in my hand…and I knew immediately that she would be coming home with me. Her old life was done, rescued from a kill shelter after her pups had been taken from her. Lonely and yet hopeful, I think. The bio on the website had said her new owner would be lucky to have this girl…and we were…and are. Violet has settled in and is part of our family. She is always sweet, sometimes hesitant with strangers (What had she gone through in the past? ), silly at times, loving her food, toys, and affection. As Scott says, she really doesn’t need a treat when she comes in from being outside, she just wants love. She may always be needy, but that’s ok. OK, too, that she sleeps on Scott’s favorite chair. She is a learning our ways, is so willing. As we all do, she makes her mistakes, like snitching food, but she’s learning. She loves the grandkids, her large fenced-in yard (Had she ever been free to run before…or was her life always in, at most, a cement-floored kennel? ), taking walks along our country road, visiting my elderly friend Margaret and lying at her bedside. Last evening, at the vet’s office where she had come for a re-check, a glimmer of her past life surfaced to us. Another dog, an elderly beagle had arrived. And Violet made a sound we hadn’t heard before. 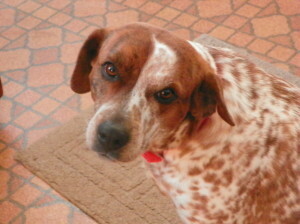 A funny little whine of calling out, of hopeful recognition, maybe of missing other dogs, and her pups. Maybe there’ll be a companion for Violet someday. For now, we are so happy to have found her. “Lucky” the bio had said. More than that…we thank God for Violet, yet another blessing. This article was posted in Journal. Bookmark the permalink. Follow comments with the RSS feed for this post. Post a Comment or leave a trackback: Trackback URL. Wow,what a day to break down!! Love the story of Violet!!! !